Life has been ramping up of late and then some. My sister L is holding her own. She is slowly coming to terms that she will not be cancer free. In one of our talks with the nurses L asked when they intend to remove the tumors. They are not going to, the cancer is in her blood stream and lymph glands so removing the existing tumors would not truly do her any good. The continuing chemo treatments are to keep the tumors from regrowing. Of late she has been looking at $800.00 co-pays for each of her chemo treatments until she meets her out of pocket expenses. One of the drug companies that makes one of the treatments she gets has offered to pay her out of pocket co-pays which has taken a big load off her shoulders. L wants to try and return to work even if part time but the doctor won’t release her. She has good days but they are then followed by several more bad days. She has filled out the paperwork to apply for full disability so we shall see what comes of that. My mom still has not come around and even asked about how L is doing, between Kayla and I we are her rides to most if not all of her doctor appointments. L is planning on going north in June to visit our dad and other family, her doctor has told she is well enough to travel and he can help her find a place to have her chemo while she is up there so she doesn’t miss a treatment. My dad has his business leased out and by summer possibly even sold so he will be returning to here with her so there will be one other person to help out with getting her to appointments, etc. Everything is progressing along well. The mortgage company has been supplied all the paperwork they need from me. The loan has gone to underwriting and I have met all the conditions they asked for. SO for right now we are in a holding pattern and best case scenario we may have a closing date by tomorrow afternoon. To say we are excited is putting it mildly. We have the laminate picked out for the living room floor. The carpet is picked out for the bedrooms. Paint for the walls has been picked out. Only thing left is the tile for the bathrooms. Worst case, we will have the closing date by end of the week on Friday. In the mean time the 60-day notice has been turned into apartment management. They didn’t blink and eye but then again no one stays. In our block of apartments there is only one family left that lived there when I moved in. We are ready to move forward with this chapter of our lives so we can then begin the next. Sunday I got to make good on my Valentines gift from my babygirl. She gave me a gift card to Woodcraft and I cashed it in for a class on pen making. It has been a while since I got to play with power tools of that magnitude and it was fun. It has given me some ideas for the shop I am going to put together in the garage once we get moved in as well. 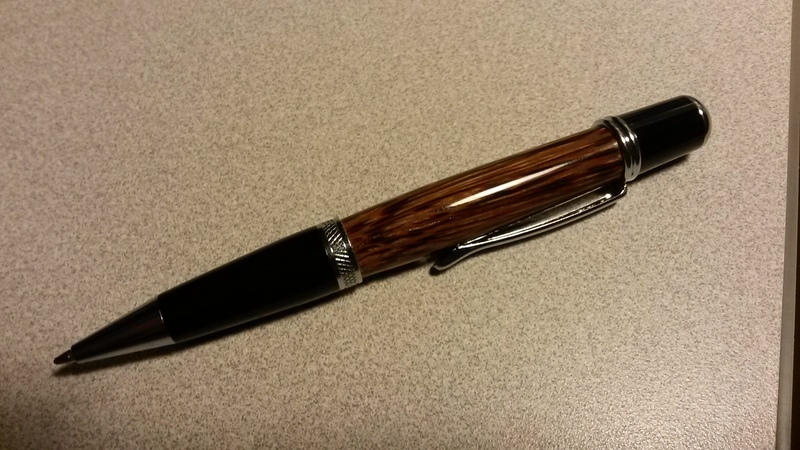 Here is the pen I made, fittingly I gifted it to Kayla since it was because of her that I got to take the class. The wood I used to make the barrel of the been is called Palm Red, it is a soft and porous wood which actually made it a little more difficult to work with. All in all for my first I think it came out quite well. I’m praying for your family, and your sister in aprticular. Thank you little monkey, good to see you. Nice pen! I imagine it was very satisfying and relaxing to do a project like that? Draco, it was very relaxing to do. I’m looking into adding a mini lathe to my other tools at some point down the road. Life is just sort of ticking along, isn’t it? And tomorrow, we get to spend the whole day together!! Looking forward to tomorrow as well….we both need it. One of those moments to teach you some patience little one. wow…things are moving forward for you guys…I’m so happy for you both there. I’m sorry to read about your sister…it’s such a devastating illness. And it’s hard to be the primary caregiver under these circumstances. Sending prayers your way…you’re doing a powerful thing there, you know…she needs you and you stepped up. nilla, it is funny in a way when we were young I always took care of L, she was my kid sister and I always had her back. As life happened, family, work, moving, etc we grew apart. In it being what it is it has pulled us back together. We will be sure to do that with the Rosemary, I have a plant growing to pinch the sprigs off of. Wish you and your family strenght to keep fighting,to be able to see the beauty of tomorrow….together. Thank you so much Reader, she’s a fighter and she isn’t giving up anytime soon. Prayers for you all, John. And congratulations on the home. Wonderful update and best to you both. Thanks Peep, this is and should be the last move for a while. That is our intention anyway. If we like it there enough we may consider moving up to a 3-bedroom once we get a few other things behind us. Sending love and prayers to all of you. I am so sorry that she, and you have to go through this…. But bless you and Kayla for being there and taking care of her. Cinn thank you for the prayers, they are much appreciated. Hope all is well with you as you settle into your new hone with Hunter. You both have much on your plate…hugs and a gentle move. I have been down the road of a loved one with cancer. Not an easy road and an ever changing landscape. hugs to you both and a safe and beautiful landing in a new and wonderful home. it is a full plate indeed, even today I took a day off work hoping to make some time to just be with Kayla but life popped up and we ended up running errands instead. So very sorry about your sister, Sir. My prayers for her and you all. I agree with Cinn, bless you both for seeing her through. Congratulations on the new home. I am so sorry to hear about your sister but super excited about the new house for you both!!! Thank you Selina, it certainly is a mix of emotions. Sometimes life is a slow dance, and sometimes, it’s a break dance. Looks like you are not slow dancing right now. I’m thinking of both of you and the many things you are balancing. What a blessing to be together to support each other through these very challenging days with your sister and family. I also know that through this you are setting a tremendous example to two little boys about the importance of family. Sending prayers up for the strength to keep all your responsibilities balanced. And can’t wait to see your new pad!!! Hugs to you both. Thank you Angel, We just got some good news tonight on the home front, one more hurdle has been cleared and we are on the downhill slide. I’m So very grateful Kayla is a part of my life and that she has stepped up to help with my sister anyway she can. That cancer is a horrible thing. 🙁 I am a new follower here but I don’t believe people have to know each other to pray for one another or the families they belong to. So I will be keeping your sister in my prayers, Mr. Brownstone. SSK, welcome and thank you for adding your prayers for my sister. Thank you Tom, it certainly has been a roller coaster ride that is for sure. Your prayers and thoughts for my sister is much appreciated. Sending prayers for your sister. So much going on for all of you. It’s apparent that you have strength in each other and there are so many good things happening. I’m excited for you both. Great pen, too! You’re talented. Of late it seems there is a never ending list of things going on. What makes it easier is that we have one another’s back to get through it all. I’m with you Vile, if only it were so easy. My thoughts go out to you and your family, Sir. I am sure you are all giving her very much love and care. Thank you Sir, we are doing our best to surround her with love. Your post leaves me feeling torn – heartache for your sister, joy for you and Kayla. All I can do is send my best thoughts and wishes for your sister’s health and rejoice in your happiness and love. By the way, the pen you made Kayla is an object of true beauty! Thank you Minx; it is a mix of feelings indeed, your thoughts and wishes are most welcome. As we progress in getting our new home set up I am slowly setting up a wood shop to delve into that a bit more. Life and it’s damn curve balls… prayers to your sister Hun… I have a 24 yr old cousin who just found out last week she has a brain tumour, we find out end of this week what will happen next!?! Love your pens! Thank you, sorry to hear about your cousin.